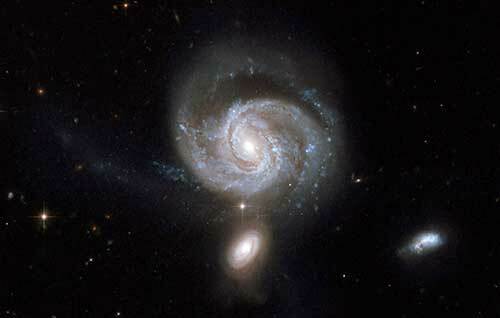 (Nanowerk News) A study using multiple radio telescopes confirms that supermassive black holes found in the centers of galaxies can form gravitationally bound pairs when galaxies merge. The paper published in the Sept. 18 issue of Nature Astronomy sheds light on a class of black holes having a mass upwards of one million times the mass of the sun. Supermassive black holes are expected to form tightly bound pairs following the merger of two galaxies. "The dual black hole we found has the smallest separation of any so far detected through direct imaging," said David Merritt, professor of physics at Rochester Institute of Technology, a co-author on the paper. The supermassive black holes are located in the spiral galaxy NGC 7674, approximately 400 million light years from earth, and are separated by a distance less than one light year. The study was led by Preeti Kharb, from the National Center for Radio Astrophysics at Pune University in India and co-authored by Dharam Vir Lal, also at Pune University and Merritt at RIT. "The combined mass of the two black holes is roughly 40 million times the mass of the Sun, and the orbital period of the binary is about 100,000 years," Merritt said. "A supermassive binary generates gravitational waves with much lower frequency than the characteristic frequency of stellar-mass binaries and its signal is undetectable by LIGO," Merritt said. "Using very long baseline interferometry techniques, two compact sources of radio emission were detected at the center of NGC 7674; the two radio sources have properties that are known to be associated with massive black holes that are accreting gas, implying the presence of two black holes," Merritt said. The galaxy hosting the binary supermassive black hole loudly emits radio waves. The detection confirms a theory predicting the presence of a compact binary in a radio galaxies bearing a "Z" shape. "This morphology is thought to result from the combined effects of the galaxy merger followed by the formation of the massive binary," Merritt said.